Need a Root Canal? A Dentist in Long Island City Explains Why! You’ve probably heard the expression, “It will get worse before it gets better.” In some ways, those words could be applied to needing a root canal. After all, it’s bad enough to have a toothache, but then being told you need a root canal can feel like the situation has gone from bad to worse! But even though a root canal sounds terrible, it’s actually much easier than you would expect. Not to mention that a dentist in Long Island City only recommends one so they can save a tooth that would otherwise be lost. But even if root canals are easier and more beneficial than you thought, why do you need one in the first place, when sometimes just a filling or crown is enough? Keep reading to find out! 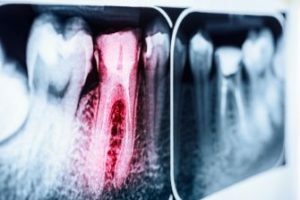 Why Are Root Canals Necessary? Enamel is the outer layer and it’s the hardest substance in your body (even harder than your bones). The second layer is called dentin, which is a little softer than enamel. The innermost layer is where the nerve and blood supply of each tooth reside – it’s called the pulp or nerve canal. Any time you have a damaged tooth, whether it’s a cavity, fracture or another injury, a dentist will start by assessing how much of each layer is affected. With small cavities or fractures, the pulp and nerve of the tooth are still quite intact and most of the tooth structure still remains. This is when either a filling or crown is recommended. But if a cavity or fracture is large enough, it can reach the nerve of the tooth, where it can cause an infection and severe pain. In this scenario, a root canal is needed to remove the infected pulp, while saving the remaining outer layers of the tooth. Root canals have a bad reputation, but oftentimes patients report that they were no more difficult than getting a filling! That’s because a dentist will start by making sure that you’re completely numb and comfortable. Then they’ll make a small opening in the top of your tooth to remove the infected nerve. Finally, the canals that once held the nerves will be filled with a material called gutta-percha and the tooth will be sealed over with a tooth-colored filling material. Remember, teeth are hard to come by. It’s well worth it to make every effort to save a badly damaged tooth so that you can continue using it for many years to come! Dr. Ishwinder Saran is a general, cosmetic and restorative dentist who knows the value of saving teeth whenever possible. Having pursued additional training after dental school in a wide variety of fields, including root canal therapy, he’s able to make an otherwise intimidating procedure easy for his patients. If you have any questions, he can be contacted through his website or at (718) 530-6539.